At IBC2017, Bridge Technologies (Stand 1.F68) will be launching a radically new user interface that provides an entirely new way of viewing network behavior, enabling media professionals and others to obtain a highly intuitive view of data activity on the network with unprecedented accuracy and speed. It is designed specifically for those in media production dealing with high bitrate video as characterized by ST2110 and ST2022.6 who need to have real-time, highly accurate knowledge of the behavior of networked packets and precise information about the content being carried. Instrument View is a new GUI designed to make it clear, in an ST2110 and ST2022 world, which packets are audio, which are video, which are control and so on — something that has not been achieved previously. 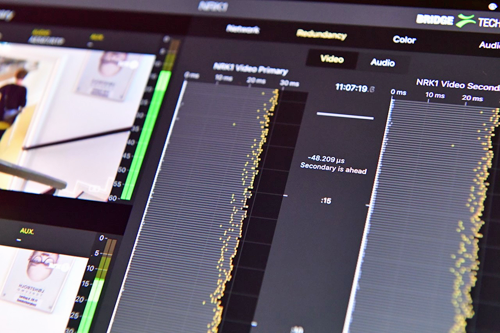 With insights into the network and packet flow of any bitrate IP flows, Instrument View’s extended metrics and intuitive real-time packet views enable instant understanding of what’s going on in the network. The packet information also contains real-time ST2022.7 redundancy analysis, showing the precise correlation between the primary and secondary flows of ST2110 streams. In addition, Instrument View provides powerful analysis of the content with colorimetry of the video, and accurate understanding of the audio stream. Significant attention has been given to the Instrument View user interface so that every function is available through on-screen touch controls and provides instant feedback. Source selection is always available with programmable buttons on-screen giving immediate access to the various signals selected for monitoring. Instrument View is an option for the high performance VB440-SW IP probe with dual 40Gb Ethernet interfaces. The VB440-SW and Instrument View, together with the full range of Bridge Technologies solutions for network understanding and optimization, are being showcased at IBC. Simen K. Frostad, Chairman, Bridge Technologies, noted that Instrument View is like nothing the industry has seen before in terms of the speed and accuracy with which it can deliver remarkable, intuitive insights into network behavior. As IP becomes increasingly pervasive within the industry, and as MoIP, SDIoIP, ST2110 and ST2022 become ingrained in its fabric, it’s vital that every professional — not just the network engineer — has access to this kind of information about the performance of the network. Instrument View responds to that need, providing a much simpler, more instinctual insight into what’s going on so that appropriate corrective action can be taken as quickly as possible, ensuring optimum Quality of Experience.